...and within 2 weeks, you'll have your $$! Earn 60% on your sold items minus a $15 fee. Earn an extra 10% by assisting at the sale! Price & tag your items all year 'round 24 hours a day! E-checks are sent out within 2 weeks of the sale. JBF recommends you have at least a minimum of $100 worth of merchandise. NOTE: Alliant does not charge for parking at drop off and pick up. Team Members (Volunteers) shop early! We'll send an email with team member registration is open! Be the first in the door! The more you help the team, the earlier you shop! Work is assigned when you arrive. Folks are moved around based on the needs throughout the sales event. All shifts are four (4) hours in length. Earn an additional 10% - that's 70% - on your sales. Parking passes are provided if helping on days Alliant charges for parking. Shop BEFORE the public on opening day and the half-price sale! Snag a BONUS shift and earn more hours than actually worked & shop earlier! What can I expect to do at the sale? Setup: Setup racks, shelving and tables. Hint - Husbands & fathers are a great help! Inspection: Inspect seller's items using JBF guidelines. Checkout: Assist shoppers with purchases. Organizing: Be available for questions, assist with the hold area, organize racks & tables, watch the sales floor. Sort: Sort items for donation or pick up. Breakdown: Breakdown racks, shelving & tables, load truck. Hint - Husbands & fathers are a great help! Plan to arrive 10 minutes before your shift and we'll train you on the task we need help with! What to Wear - What to Bring! Be comfortable! Please wear closed-toed shoes and comfy clothes. Bring a water bottle - we'll have a water cooler and/or a bubbler available! If you have special dietery needs, bring along a lunch bag. There are no concessions on-site. Arrive 10 minutes early and we will train you on all you need to know! We depend on you to help run the sale. Without you, we cannot hold this great sales event for you and other families in the area. Because of this, any hours not completed before the end of the sales event must be completed prior to the next sales event in order to register as a team member in the future. When will I receive my pre-sale shopping pass? Pre-sale shopping passes will be provided during drop-off or can be picked up 10 minutes before your designated pre-sale shopping time. Childcare is not offered. However, if you can get a friend to assist for a separate shift and take turns watching each other's kids you each will shop early! I'm pregnant or have a medical condition. Is it OK for me to help at the sale? If you are pregnant or have a medical condition, you will want to help when the workload is less. We have several shifts available with jobs that can be done sitting down. If you need these positions, please email us with your request after registering and we will do our best to accommodate your request. Thank you for helping! This is YOUR sale and it cannot run without you! Your help increases the size of your check! PLEASE NOTE! We are evaluating the inspection process and how it will organized for 2018 fall! - Sort clothing by gender and size before arriving to facilitate putting items on the floor. - Allow 45-60 minutes for check-in and putting items out on the sales floor. TIP: Bring a wagon! Rolling Racks MUST stay in the building! - Check in upon arrival. - New consignors and those needing a refresher will pass through the inspection station. All others will place clothing directly on racks. - All shoes will be inspected. - Items not meeting quality standards will be returned at pick up. - Check out to receive pre-sale passes! 7:00PM-8:00PM: Only items not requiring inspection. No clothing/shoes. Enter through the same doors used for Wednesday drop off. 7:00PM-7:30PM - Team members ONLY! ** No exceptions for early pick up. This adds strain to the system and schedule. Consider helping with breakdown. Breakdown must be complete before anyone is able to leave with their items. Items not picked up by 8:31PM are donated to WE Care. No Exceptions! Shop with your nursing infant in a sling or carrier prior to 6:00PM. Children under 12 and strollers welcome at 6:00PM for Family Shopping! Team Members are consigning men and women who give of their time in exchange for the privilege of shopping early! 4:00PM-8:00PM - Registered First-time Parents, Grandparents, Foster parents + spouse and a friend. 6:30PM-8:00PM - Invited guests with special passes. 5:30PM-8:00PM - Invited guests with special passes. * All items must be tagged using our online tagging and barcoding system. * Safety is a priority with JBF. Use the link at the bottom of the page to check your items. * You set your own price on all items. Use the pricing guideline available at the bottom of the page! * Generally, items sell from ½ to ¼ of the original price depending on the condition. * If an item of clothing cannot bring in $3.00 on its own, pair it with another item. * Items must be priced in .50 cent increments. * Items requiring batteries must include working batteries. Shoppers want to see the toy is in working order before making a purchase. Batteries can be purchased inexpensively at dollar stores. * Strongly consider including clothing items in the Half-Off Sales - shoppers look for this! Junior clothing will no longer be accepted. Only your best 20 pieces for sizes 14-18! Only 20 name brand pieces of your best, please! Sleepers and onesies must be hung on a small plastic hanger. Use appropriate-sized plastic hanger. Department store hangers are acceptable. All JBF clothing items are sold with hangers so we are unable to return consignor hangers. Your unsold clothing will be returned on hangers. Wire hangers tend to get tangled in the racks. Shoppers tend to pass by tangled items, affecting their shopping experience and removing money from your pocket. Need another reason to avoid wire hangers? They may rip clothing in your shopping bag on the way home! Please, no wire hangers! Clothing purchased in the last 5 years will be accepted. Clean and press items. A little ironing goes a long way for the seller! Replace missing buttons, sew loose hems and seams, and clip loose threads. Button all buttons, snap all snaps, zip all zippers. The newer the item looks the better it will sell. Ensure items will stay on the hanger by using large safety pins if necessary. Hang two-pieced garments of the same size with the bottom garment attached with safety pins. Sets tend to sell better (under size 10) so match things up if possible. Use a lint brush or packing tape to help remove any pet hair or lint. Clean, Clean, Clean! A few minutes with a magic eraser goes a long way! Shoes should have no holes, no scuffs, no smell and should not show signs of wear. Any stitching must be intact. The sides of a shoe must be clean and not discolored. Shoestrings should also be clean and not worn or broken. Soles must be gently worn and should be clean. In summary, use a magic eraser, a washing machine, a little elbow grease and a little time! All will help your shoes pass inspection and sell! Shoes up to and including size 5 accepted. Clean all toys thoroughly using anti-bacterial wipes work. Toys must be working properly. If not, it will be pulled from the sales floor. Place any small parts in a zip-loc bag and tape the bag shut with clear packing tape. Fasten the bag securely to the item with curling ribbon, tape or zip-ties. Group several similar small toys together in zip-loc bags. List all items on the tag. Remember to tape the bag shut so items do not get separated. No stuffed animals or Beanie Babies.Only battery operated animals/characters in working order with working batteries will be accepted. Attach the tag to the item with clear packing tape, safety pin, or by punching a hole in the top of the tag and securing with curling ribbon. Place a piece of tape on tag before punching a hole to reinforce the tag so it is not easily torn off your item. Games and puzzles must have all pieces. If boxed, tape the box closed. 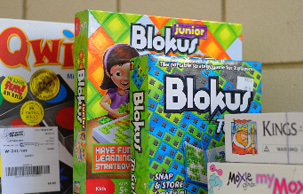 Use plastic wrap to protect surfaces of games and puzzles before applying packing pack. Attach the tag to the item with painters tape. Place tag on the back of the item in the lower right. Clean baby equipment thoroughly using anti-bacterial wipes. Please ensure all equipment is working properly. If it is not, it will be pulled from the sales floor. Attach the tag to the item with a safety pin or by punching a hole in the top of the tag and securing with curling ribbon or a zip-tie. Place a piece of tape on tag before punching a hole to reinforce the tag so it is not easily torn off your item. Plan to set up any larger baby items on the sales floor during drop off. Families will look past items which are not set up. Experience has shown bedding is not a big seller and takes up a large amount of space so we have limited bedding which is accepted to only crib bedding. Breastpumps as they are now subsidized by insurance. No crib bumpers. While not on the CPSC list, our friends in Chicago have banned the sales of bumpers. zip-ties - a seller's best friend! What percentage of my items can I expect to sell? Most consignors sell approximately 40% to 80% of items in sizes 2-8. For sizes under 24 months, the percentage drops due to the sheer volume of merchandise received. People receive infant clothing as gifts, hand-me-downs, etc. Sizes 10-16 tend to sell at a lower percentage as children become choosier when they near the teen and pre-teen years. What items are you taking? JBF accepts all seasons at both the Spring and Fall sales events. It is highly encouraged to bring clothing based on the season of the sale as items not in season do not tend to sell as well as items in season. Other great items are toys, books, videos, strollers, baby equipment, nursery items, large play equipment, infant/toddler bedding, changing tables, toys, etc. You may bring anything related to babies or children! I am selling an item which folds up, does it need to be assembled? Yes. Items sell much better when the customer can see what it actually looks like and it helps to ensure that all pieces are present. Ensure there is rack & table space for all consignors. Ensure items from all consignors are visible. On Sunday, select the 2:15PM-6:15PM LARGE VOLUME CONSIGNOR SHIFT in which you will pull your own items from the sales floor. This shift is required and will not earn any additional percentage on sales. Work any other 4-hour shift throughout the sale to earn an additional 10%. These changes are being implemented in an effort to be fair to all participating consignors. - Use white 8.5 X 11 CARDSTOCK, 67lb minimum. No regular copy paper or glitter paper will be accepted. - Use "Print Tags (Alternative)". Adobe Acrobat must be installed. - Paper orientation must be portrait. - Please print with best quality to ensure the items can be read by scanners. - No handwritten information will be accepted on tags. - Having trouble printing? Try another browser! Tip: If you cannot print your tags at home please consider using a friend’s, relative’s or the library's computer/printer for your bar-coded tags. You can also print to a file saved as a PDF and take it to your local copy store to print, too! Check out the "Help" section on the tagging site - it contains some great information, too! Why does the star mean NO half-price? Isn't that confusing? Items with a star are the only items that REMAIN FULL PRICE on the sale days. This is done to prevent any not so honest shopper from walking around with a pen and changing tags by adding stars on the sale days. You work hard to prepare your items! We appreciate the hard work you put into it! An email will be sent before drop off explaining the process to all registered consignors.